When one hears about a friend or acquaintance going skydiving, bungee jumping, racing, white water rafting, etc., the news is usually followed by one of two reactions: “That sounds amazing. I would LOVE to do something like that” or “Wow that is terrifying. I could NEVER do something like that.” So which person are you? There are so many wonderful stories about adrenaline adventures involving people with disabilities. 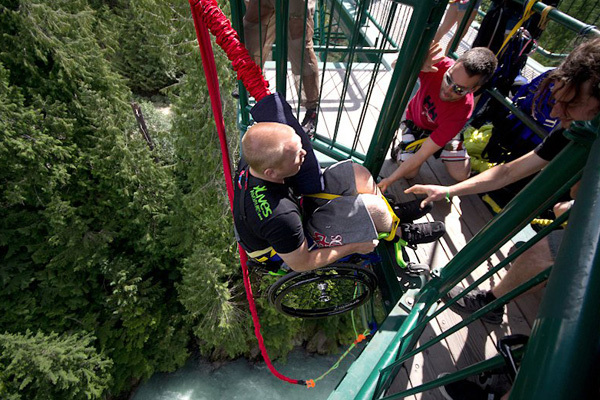 You may remember the young woman who went bungee jumping in her wheelchair in British Columbia last year. According to CBS News, Christi Rougoor loved racing her dirt bike and after a motocross accident left her in a wheelchair, she was searching “for that rush to replace what I have lost.” While the reasoning may not be the same for all, most people who choose these types of adventures, are indeed looking for a rush. Recently Kyle Maynard made the news. Kyle is a 25-year-old congenital amputee with a mission to climb Mount Kilimanjaro. Kyle was born without arms or legs, but for him that was never a barrier. The expedition aims to “demonstrate to young people with disabilities that no obstacle is too great to be conquered with an active, no-barriers lifestyle and mindset,” says the Mission Kilimanjaro website. Despite all of his accomplishments and adventures, climbing to the 19,341 ft. summit of Mt.Kilimanjaro will be Kyle’s toughest test yet. And then there is motocross racer Ashley Fiolek, who has brought a lot of attention to the sport as a deaf athlete. Ashley explains that being deaf can be both positive and negative in this sport. Because she cannot hear when racers are on her tail, she does not feel the same pressure as other racers. However, she has to be very careful to hold her lines when racing since she cannot hear other riders passing. Pretty cool individuals. Maybe you’re reading this article and saying “okay, I’m ready, sign me up.” If so, let us introduce you to the company that has made many adrenaline adventures possible: Canadian-based 9Lives Adventures. The founders, Karim Ladki and Matt Thola, both suffered from C7 spinal cord injuries and bonded over their love of adventure and their thrill-seeking spirits. The result? A company that specializes in tandem skydiving, bungee jumping, wheelchair skateboarding, jet boating, and sit skiing. So if you’ve got the adrenaline bug, get to it! Jump out of a plane, climb a mountain, go jet boating. Nothing is stopping you. With the holidays just around the corner, the pressure is on to find the perfect gifts for your friends and family. So this year, why not do something different? Throughout the year, there are always children and families in need. What better time to help someone than the season of giving? The Jackson Sun recently published an article about the Reid family in Kentucky who are asking for help this holiday season. They adopted their daughter Jasmine when she was 12 years old. Now 20, Jasmine has cerebral palsy and scoliosis and suffers seizures. She uses a wheelchair and needs oxygen. The family cannot afford a vehicle that accommodates a wheelchair so Jasmine is limited to walks around her neighborhood. We all have families like the Reids in our communities. This holiday season, explore the options. Giving back can mean donating toys and gifts to those in need, volunteering with your family for an afternoon, or making a monetary donation to a charity in lieu of exchanging gifts. We did some research and found a few charities to get you started. But there are so many wonderful organizations out there. Have a look and find one that you are interested in and shares your passion for a cause. The Sunshine Foundation is a national charity in Canada that helps children with severe physical disabilities. After losing his teenage son to muscular dystrophy, an Ontario police office created The Sunshine Foundation of Canada to brighten the lives of other children and families by fulfilling dreams. Variety – The Children’s Charity is a philanthropic organization with locations throughout the United States. Variety’s National Mobility Program started in 2009 and provides assistance to children with mobility concerns. Children want to be active in their communities but they need access. Variety provides equipment such as adapted bicycles and medical equipment to children in need. And in recent local news (for us here in Brampton, Ontario), singer John McDermott brings Christmas cheer to veterans during the annual Christmas concert at Sunnybrook Veterans Centre. McDermott has raised more than $1 million for McDermott House Canada, a registered charity dedicated to serving those who serve. Their first project is to create an innovative and warm, home-like environment for Canadian veterans, military, first responders and community patients in the Palliative care Unit at Sunnybrook Veterans Centre in Toronto. Thank you to these organizations for all that they do. Happy holidays to all! What do you PUSH for? Mia: I PUSH beyond my comfort zone to explore new adventures! Angela: I PUSH for a more peaceful and happy world! Chelsie: I PUSH to inspire others to live to their fullest potential! Tiphany: I PUSH because stereotypes don’t define me! Auti: I PUSH to command attention! Who are these women? Sundance Channel calls them the Push Girls. Season One has come to a close but a second season is in the works and if you haven’t heard of them yet, it’s time to learn about these phenomenal women. Push Girls is a 14-part reality television show that follows the lives of four women in Los Angeles. The common denominator is their wheelchairs, but the show is not about wheelchairs. “It’s about lives and how we live life to the fullest. We are four women living in this world trying to have a normal life,” says Angela, one of the Push Girls. We see both how the women perceive themselves and how others see them and their wheels. Auti and Angela became friends first when working in the entertainment industry. Six years later, Mia took part in one of Angela’s acting classes. And four years after that, they met Tiphany, who now lives with Angela. Angela is the only quadriplegic of the group; the other three women are paralyzed in the lower body. And from this group of women, Push Girls was born. “We realized we had a kindred spirit of reaching out, inspiring, encouraging and motivating people. And we all have different walks of life, so much to share,” says Auti. A fifth Push Girl was added after the pilot: Chelsie Hill, a young performer who dances with Auti and Mia in a group called Colours ‘n’ Motion. The show has had a huge effect on people in wheelchairs, as well as able-bodied viewers. “Other shows dealing with disability often either downplay or sensationalize what it means to use a wheelchair, but Push Girls is much more holistic” (New Mobility Magazine, June 2012). It’s a show that means something different to each person. For some, it’s about informing people about paralysis and spinal cord injury. For others, it’s about five independent women and their friendship. Maybe it is the truth about life in a wheelchair. No matter what you take from it, it’s a wonderful accomplishment. Its existence itself is exciting! This could be the start of much more inclusion in television. And audiences are responding! Push Girls hit social media hard with their Facebook page, featuring Q&As with the 4 stars of the show, inspirational stories of other women or wheelchair users, the Push Girl hall of fame, and more. Fans have responded to the show in a huge way – social media blew up every Monday night and now the series has been renewed for a second season. People in wheelchairs are seeing themselves not only represented on television but celebrated, and these strong women are to thank. Creator Gay Rosenthal says “It’s real, it’s outspoken and it’s from the heart” and that’s why we love it! Congrats on your upcoming second season ladies! Creative thinking is a must when designing for children with disabilities. It takes a good understanding of your child’s condition and what stimulates your child combined with a big dose of fun to make it a great kid’s space. A child may have a physical need for access of the need for mental stimulations. Parents may be looking for ways to incorporate or hide medical equipment. Ginger Rodriquez, an interior designer and mom featured in the Washington Post believes that children with special needs spend more time in their rooms. Designers need to find new and interesting ways to divert a child’s attention away from his or her disability. We spoke to Cynthia Meyers Griffin at CMG Interiors in Washington D.C. about the process of designing for a child with special needs. The first step is always getting to know the child. What are his or her needs? What will the room be used for – play, homework, rest? Does the child have a favorite color? It is also a good idea to talk to the parents to learn more about the child and what they are hoping to see in the room design. Cynthia also recommends doing some research on the child’s disability to better understand the challenges and needs and possibly design solutions that others have found effective. From there, the designer launches into the creative process to dream up the perfect room. For children who are easily stimulated, she recommends calm colors, and just the opposite for children who need energizing. Some children may have issues with light, in which case diffusing or using artificial light is a great idea. Other solutions include spinning elements to help children who use movement to process information, rugs for diffusing sound or providing sensory stimulation, or high ceilings and open spaces for stimulating toys such as bouncy balls. Ginger Rodriguez describes her design for her son in a WP February 2012 article (no longer available online). She installed hardwood floors so that her son could better use and move his IV pole. 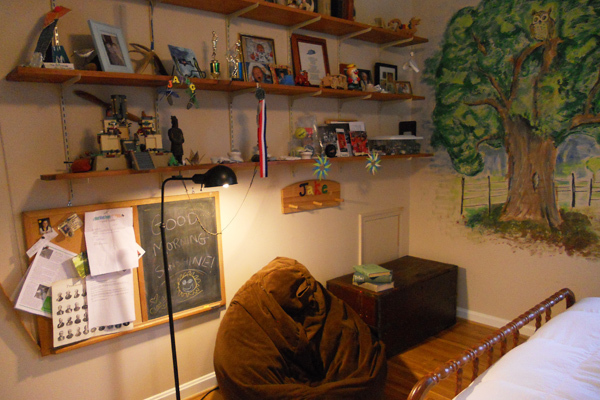 Lowered light switches and a control for the stereo system gave Sean control and independence in his room. She added a personal touch by painting the walls light blue with an image above the bed of a little boy flying an airplane and laughing. For parents looking for Do-It-Yourself tips and tricks, Terri Sapienza outlines a number of ideas here, including hide-away bed rails and pocket doors to maximize space. Designing a room for a child with disability can make a huge difference in his or her life. Not only can it be a rewarding experience for the designer, but the child is able to be self-sufficient and independent, something of utmost importance to children with disabilities. Having a room painted in your favorite color, with your favorite toys, room for your medical supplies, and easy access to light switches, the desk, the bed, etc. gives a feeling of “home.” And who doesn’t want that feeling for their child!